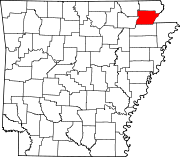 Coordinates: 36°14′41″N 90°21′12″W﻿ / ﻿36.24472°N 90.35333°W﻿ / 36.24472; -90.35333 Hopewell is an unincorporated community in Greene County, Arkansas, United States. It lies at an elevation of 285 feet (87 m). This page was last edited on 30 June 2018, at 10:23 (UTC).